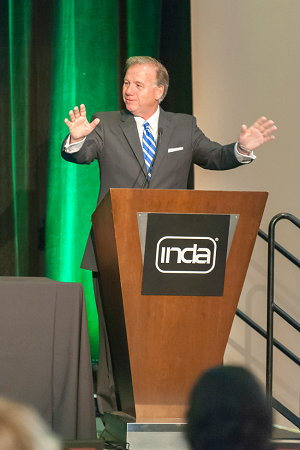 Cary, NC, June 15, 2016 – INDA, the Association of the Nonwoven Fabrics Industry, recently wrapped up its 10th annual World of Wipes® (WOW) International Conference June 7-10 with attendees and board members giving the program content, speaker presentations, and networking high praise. 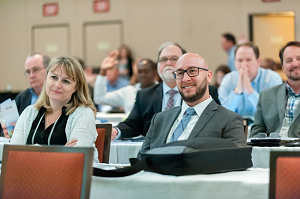 This year’s conference held at the Sheraton Grand Hotel in Chicago attracted more than 400 registrants to discuss business in wipes, and receive information from over 25 valuable presentations, and interact during receptions, breaks, and organized dinners. 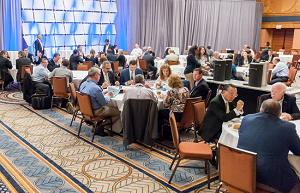 Coming on the heels of IDEA16, the world’s preeminent event for nonwovens and engineered fabrics, the turnout demonstrated the strength of the nonwovens wipe sector. Attendees reported that they valued the new connections they made with participants who were unique in their interest of wipes. WOW is the only conference dedicated entirely to wipes. According to INDA, WOW participants were engaged and attentive, gaining valuable insights in the global wipes business spanning all facets of the value chain, including flushability, manufacturing, packaging, standards, consumer awareness, equipment, and market trends. Kicking off with an indoor and outdoor welcome reception sponsored by Kimberly-Clark Professional, featuring seafood and pasta stations along with a string quintet playing popular rock songs, the atmosphere throughout WOW encouraged face-to-face interactions. Preceding the conference, INDA’s Wipes Academy was presented by Rob Johnson, PE, Principal, Smith, Johnson & Associates. The Academy is the first and only comprehensive wipes training for the entire wipes supply chain. Tec Laboratories’ Tecnu Bites & Stings Medicated Itch and Pain Relief Wipes was the recipient of this year’s World of Wipes Innovation Award®. The annual award recognizes the product that most expands the use of nonwovens and demonstrates creativity, novelty, uniqueness, and technical sophistication within the entire nonwoven wipes value chain. Other finalists were: Kleenex Facial Cleansing Wipes from Kimberly-Clark Corporation and Keyser Cleaning Wipes from Kyser Musical Products. Walmart’s U.S. Manufacturing Initiative – Joe Quinn, Senior Director, Public Affairs and Government Relations of Walmart Stores gave the keynote address to a standing-room only audience. His compelling presentation focused on how the world’s largest retailer is supporting U.S. manufacturing by working with companies to manufacture onshore, boost sales of U.S.-made products, and source locally for materials and products. Flushability Opportunities and Challenges – INDA’s Rousse provided an update on the progress being made through collaboration, and perspectives on the threats to its flushable wipes sector, including lawsuits, legislative and regulatory activity, and global standards development, with a more optimistic view of potential end-points to the major issues. A “Fireside Chat” on Navigating the Regulatory Minefield with five experts in the area, from microbiologist to EPA Team Leader. Packaging Insights and Ideas – Presentations that were particularly timely and relevant included: Scott Hetherton of HFM Packaging, Ltd. on label bonds for peel and reseal packaging; Martin Johnson of Nypro on connecting to the Internet for reordering; and Stacy Fields, DOW Packaging and Specialty Plastics, on recyclable flexible packaging for wipes. INDA announced WOW 2017 will be held June 12-15, at the Gaylord Opryland Resort in Nashville, Tenn. For more information, see www.inda.org.